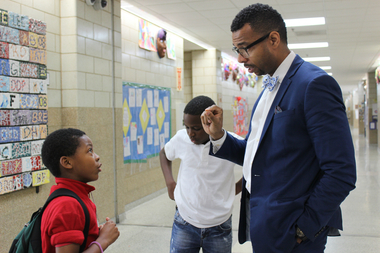 Jenner Principal Robert Croston talks to a student at the school. CHICAGO — The potential merger between Ogden International School and Jenner Academy of the Arts is moving forward. CPS announced Thursday it will host community meetings about a potential merger after soliciting community input. The proposed merger would begin during the 2018-19 school year. "For more than a year, your school communities have been contemplating whether it is in the best interest of your students to merge operations," top CPS officials Forrest Claypool and Janice Jackson said in a letter to parents of both schools. "We have observed this process and worked to provide our best insight and guidance on the opportunities this merger would present, as well as the challenges that it could pose to your children's education." Principals of the two schools first proposed the merger last year in an attempt to solve their contrasting enrollment problems. Ogden — a kindergarten-through-12-grade school with a campus in the Gold Coast and one in West Town — reports overcrowding at its Gold Coast neighborhood elementary school, while Jenner, a neighborhood school in the former Cabrini-Green neighborhood, is well under its capacity. Supporters view a merger as the most earnest attempt yet to integrate Chicago's de facto segregated schools. But opponents are skeptical that a merger would do anything to solve Ogden's overcrowding issue as more developers build high-rises in their school boundaries. The Jenner/Ogden Steering Committee, a community group that has been pushing the merger, said it is "gratified" that CPS is continuing the conversation. "We are hopeful that CPS will finally address the inequities that exist within and across CPS schools and take a thoughtful and sagacious approach in proceeding with the integration of these two schools," the group said in a statement. Parents on both sides clashed throughout last school year. After receiving tepid support from CPS and his local school council, Ogden Principal Michael Beyer dropped his plan for a merger that would have begun this fall. But supporters from both schools kept the merger momentum going by soliciting a detailed report from a consultant. The report recommended a merger, but opponents said its studies showed Ogden's east campus enrollment would drop over time without a merger, and that the school's west campus would hit capacity by 2020 should a merger be approved. "There are some contradictory points" in the report, Ogden parent Angie Verros said last month. Paul Jensen, another Ogden parent opposed to the merger, said Thursday that he is glad CPS is seeking input from all sides. "We are pleased that CPS has decided to hold off on the merger for next year and seriously consider the concerns we have heard from hundreds of parents at Ogden," Jensen said via email. "We welcome the opportunity to continue this discussion in a productive and inclusive process." The first merger meeting will be held at 5 p.m. Feb. 15 at Ogden's east campus, 24 W. Walton St. The meetings are intended to solicit feedback "from all segments of the community" before a merger is further considered. Other meetings are set for noon March 18 at Jenner, 1119 N. Cleveland Ave., and 5 p.m. April 25 at Ogden's west campus, 1250 W. Erie St.
Beyer said via e-mail that he appreciates the school district's "decision to engage our community before any decision is made." Robert Croston, Jenner's principal, is on family leave and did not return a message seeking comment.